Will honda be the next hero? Honda eyes to replace its divorcee Hero MotoCorp from number one spot. Launch of Honda Dream Yuga, 109 cc entry level bike which lacks the style punch that Honda vehicles are known for, resembles Hero’s Splendor in looks. This makes it evident that Honda Motorcycle and Scooter India (HMSI) is targeting Hero’s best selling product so far. Starting from the fourth spot in the market, HMSI overtook TVS to become Number three in November 2011 and haunted Bajaj by standing in second position in the domestic monthly sales in March 2012. HMSI is now eyeing to replace Hero MotoCorp from the number one position in India. Under the joint venture, HMSI was banned from competing directly with Hero Honda. This is the reason why Honda’s entry-level segment’s product 110cc Twister was not having a price war with Hero Honda’s products. With on road price of around Rs 51,000 Twister could only manage two percent in the category. With Dream Yuga being the spear head of Honda’s attack this year, marketing head for Honda India, Yadvider Singh Guleria targets sales of 300,000 units in the current fiscal year, thus eyeing an escalation of Honda’s share in the market from 15 per cent to 18 per cent. Honda is projecting a better value for money as compared to Hero’s entry level bikes. A comparative study makes it clearer. The Munjals who started off with a cycle repair shop in old Delhi’s Chandni Chowk one year post independence have come a long way since then. Aborting the 27 year old affair in the end of 2010, BM Munjal family bought the entire 26 per cent of Honda in Hero Honda for Rs 3841.83 crore. Till now Hero MotoCorp have been sitting happily at the number one spot and have looked strong in the market too. Technology commitments with Honda will continue till June 2014, which has left Hero concentrate on marketing and sales and have done reasonably well. The entry-level segment accounts for a lion’s share (70 per cent) of the domestic motorcycle market. It had seen sales of nearly 7.1 million units last financial year (2011-12), a year in which Indians bought 10.09 million motorcycles, more than any market in the world except China. Bajaj Auto, in the past has tried to penetrate the entry segment with at least half a dozen launches. Its Discover has been the only model that has stood out. Though Hero has begun on a good note, but a good divorce settlement can ensure only short-term happiness; it does not guarantee the proverbial happily-ever-after. That is what Hero Honda's shareholder family of 67,000 would be sweating over. Across segments, Honda last year sold two million units in the country, taking its market share to 15 per cent. The aggressive strategy started showing signs of success in their sales figures. HMSI reported 45.53 per cent jump in total sales during April at 1,98,831 units, compared to 1,36,622 units in the same month of 2011. It also reported a huge 52.02 per cent growth in May 2012 and emerges as the biggest winner. Honda sold 2,21,540 units in May 2012 compared to 1,45,729 in May last year. On month to month basis the sale has gone up by 11.42 per cent. Motorcycle section has registered a growth of 37.44 per cent while scooter section has registered a growth of a high 65.31 per cent. Cumulative sales of April-May have reported a growth of 48.88 per cent. Both the competitors have aggressive expansion plans for the future. Hero MotoCorp is well aware of the rising market share of Honda and is in no mood to allow their rivals to bridge the gap between the two. Honda on the other hand has to invest heavily in manufacturing as well as distribution to come even close to the number one target set for them. Hero MotoCorp will invest Rs 2,575 crore, to set up two new manufacturing plants in Gujarat and Rajasthan and a new R&D centre by 2013-14. Neemrana, by the first quarter of 2014 at an investment of Rs 400 crore will have an initial installed capacity of 7.5 lakh units/annum. Its proposed Gujarat plant will see an investment of Rs 1,100 crore and have a capacity of 1.2 million units by the second quarter of 2013-14. The company also announced plans to set up an integrated research and development (R&D) centre, spread across 250 acres, near Jaipur in Rajasthan entailing an investment of Rs 400 crore. Hero would also invest more than Rs 500 crore to expand capacity at its existing plants at Haridwar, Daruhera and Gurgaon. Overall, Hero is aiming to manufacture over nine million units per annum. Chasing down its former partner, Honda has announced fresh investment worth Rs 20 billion. The company plans to set up a fourth plant in India with an initial capacity of 1.2 million units, incurring an investment of Rs 1,000 crore. The fourth plant will take its cumulative capacity to 5.2 million, not far behind the Munjals, whose current capacity stands at 6.15 million per year. Honda is also adding over 300 outlets this year in order to reach closer to the customers in both urban and rural areas. As the battle between the separated couple becomes fierce, it is interesting to foresee the future leader of the Indian Two Wheeler industry. If the number of customer touch points is concerned, Hero has an edge as the number of touch points it has (5,000) is more than three times what Honda offers (1,500). Besides this Hero has penetrated well into the market, and it is the brand people have faith in. Besides this they are not keeping a foot wrong, as their expansion plans boasts of the confidence they have in them. Honda, on the other hand, have been partners in sharing the number one spot for long time and know what is required to be on the top. The growth in terms of sales is good enough to cause a worry in Hero’s camp. In a time when Indian economy is on a slow ride, Honda has registered handsome growth records against the 10-12 per cent growth registered by Hero. The point to be noted is these figures are without Honda actually entering the entry level segment with full force. 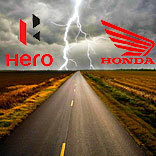 Hero are definitely on the top as of now but their real test will start when Hero’s right over the technology provided by Honda gets over after June 2014. Other aspect which will play an important part in deciding the top slot is the implementation of Bharat-4 emission norms in 2015. The Honda group has invested a lot into technology and R & D because at the same time in the west especially the European region, the movement has been onto the Euro-5 norms. Now this up gradation means greater investment in technology and innovation. This implies pricing may go down for Honda and might just surge up for Hero who has always been dependent on its former Japanese partner for technology. Honda’s aim of selling 10 million units by 2020 and making India’s contribution to its global revenue to 30 per cent, if achieved will definitely shudder the number one Hero MotoCorp and looking at Honda’s last six month’s market response leaves a perception that Honda might just have the last laugh.